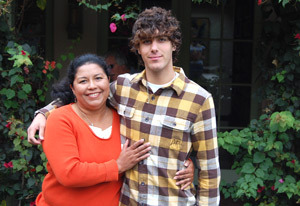 Seventeen-year-old Brett’s friendship with his family’s housekeeper gave him a better understanding of illegal immigration. Brett likes making pancakes for Emilia when she comes over for breakfast. Three years ago I watched news stories about students walking out of schools throughout Los Angeles to protest a proposed bill against illegal immigration. I didn’t think much about it at the time, and I didn’t have an opinion about immigration. Back then I wasn’t informed about political issues. But seeing kids my age get involved made me wonder why they were protesting. I thought about my former housemaid’s story of coming to the United States illegally and I realized I had a personal connection to this issue. I wanted to be more informed about immigration. Emilia was my family’s maid for 15 years. She took care of our family by preparing our meals at times, cleaning the house, and watching over my older brother and I when my parents were busy. She lived with us for several years. She was like a parent because my parents were constantly working. During seventh grade my mother told me about Emilia’s past. Civil war made life hard for her in El Salvador. Emilia, just like thousands of others, needed to escape in search of a better life. She left her 3-year-old daughter Marlyn with her mother and came to America alone. She arrived in the United States with the help of coyotes (people who help others cross the border for money). When I heard about this, I was shocked. The fact that Emilia went through such a difficult experience surprised me. I could never picture her holding on to a moving train to reach the United States. I felt that I had someone to look up to because of her courage and bravery to do what she did. I also felt sorry for Emilia because she went through so many hardships back home and God knows she experienced even more hardships on her way here with the fear of border patrol catching her and sending her back. Leaving her daughter must have been difficult as well. That Emilia risked so much to come to the United States meant that she had a lot of courage and it was the right thing to do for her daughter. 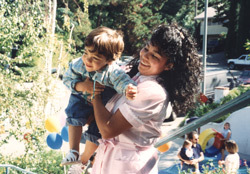 My mother told me Emilia arrived on my family’s doorsteps in Bel-Air in September 1991, a few weeks before I was born. She’d been recommended by another housekeeper who was her relative. The first couple months were very hard for Emilia. She would sob in her room, wondering if she would ever see her daughter again and realizing there was no way to go back home. If she returned to El Salvador to visit her family, it would be very difficult for her to cross the border again. My parents gave Emilia her own room and made her feel at home. Emilia saved all the money she earned working for us to send to her family in El Salvador. She wanted them to leave the warfare and move to L.A.
Brett still gets together with his former housekeeper, Emilia, at his house on Sunday mornings. My mother told me that when I was born, a smile came on Emilia’s face. She felt as if she had her own child to take care of and it made her happy. Later my mom told me that Emilia saw me as her son. I felt thankful because I never thought that somebody (other than my parents) would think of me that way. I remember as a child, we would spend our afternoons at Beverly Glen Park. I would run around the nearby golf course touching each hole’s flag pole while Emilia would chase after me, trying to catch up to me with her arms stretched out in front of her, panting for air. During my first years of school, we would spend our mornings having hot Cream of Wheat or oatmeal, and chocolate milk. Also, Emilia would accompany us on our family road trips to Yosemite National Park, Idaho and Big Sur. Having her with us on vacation made me feel like she was part of the family. She moved out of our house when I was in second grade. She was still our housekeeper off and on, but she came only three times a week. Later on, Emilia married Arturo, who was our plumber, and started a family in Reseda. They had a daughter, Gabriella. Eventually, Emilia’s daughter Marlyn moved to California to live with the family. Her dream finally came true when she was reunited with her daughter. Unfortunately, Emilia’s mother did not want to relocate to Los Angeles because she did not want to leave El Salvador. Although her mother passed away recently, she was able to come to Los Angeles to visit her family before she died. Even though Emilia moved, I still spent time with her. On the first Thursday of the month, I’d get out of school early. That’s when I’d have a chance to see her. I’d come home around 12:30 and we’d go to lunch. I’d tell her how I was doing in school. We’d go to Baja Fresh or the Olive Garden. Sometimes I’d have dinner at her house and she’d serve rice and beans and chicken. Afterwards I’d play with her daughters. She was like a 1950s mom. She puts in a lot of effort to making her house perfect. She invited me to Gabriella’s birthday parties and I’d play with Gabriella on the moon bounce. Spending time with her outside of my house, I got to know her as a person. She helped me with my Spanish. I’d try to order meals in Spanish and she’d help me say the right thing. Now I can speak to her in Spanish. I am fortunate to have her see me as part of her family. She was also there for me. When I had problems at school, she’d help me out. Once there was a guy who was being a jerk. He put me down, trying to be cool. We’d get into fights. My dad would tell me to fight back and Emilia would tell me to walk away. Her advice made more sense. If you fight, the problem is just going to escalate. The next time he was a jerk, I ignored him and we didn’t get into fights anymore. I have been trying to learn more about Emilia and her past to broaden my views on immigration in America. I recently watched the movie Innocent Voices about the civil war in El Salvador in the 80s. It was about an 11-year-old boy who was recruited to the army. He escapes to find his mother, but their village was burned. Before I saw the movie I knew there was oppression in some countries, but I didn’t know exactly what it was. I was shocked to think about how people dealt with this. It gave me a better sense of what people in war-torn countries were going through and why they wanted to come to the United States. One of Brett’s favorite memories is playing at the park with Emilia. Some media portray illegal immigrants as “aliens” who harm America’s economy by taking jobs from citizens because they’ll work for lower wages. What they don’t show is that these “aliens” are arriving from harsh nations where they are surrounded by poverty and political strife. I have watched Lou Dobbs on CNN. He talks about illegal immigrants as “aliens” and says they should go home. Listening to him is hurtful and frustrating because he is always so negative. I have also researched policies on immigration such as the DREAM Act. I wish this would become a law because it would allow undocumented students who complete at least two years of college or two years in the military to apply for U.S. citizenship. I hear news stories about how we are paying taxes to build a fence along the U.S./Mexico border to keep immigrants out. My friend agrees with building a fence because he thinks that people should wait in their home nations to obtain a visa or permission to come here legally. I don’t agree with the fence. The fence would not reduce illegal immigration because people can figure out a way to get around it. Also, fences represent our country’s negative view toward illegal immigrants. Emilia got her green card, which means she has permanent residency and can live here legally. She has helped me put a personal face on illegal immigration. The hardships she faced back home and on her way here made me become accepting to more open immigration. I don’t think immigrants should have to face such burdens to get to the United States. People shouldn’t have to sneak into the country, but we still have to let people in for the right reasons. How can we keep criminals out of the country? Another dilemma is the MS-13 gang from El Salvador. When Emilia lived in an apartment in West Hollywood, some MS-13 gang members would come to the apartment building and hang around its pool. She was afraid of them because they were dangerous. Allowing more people into the United States is not as simple a solution as I wish it could be. I kind of regret I didn’t ask Emilia about her life in El Salvador as much as I should’ve. Basic stuff like what were you like as a kid? I have always considered Emilia a true best friend. She is kind, loving and has a wonderful sense of humor. We never had any arguments. We always had a good time. I get birthday and Christmas cards from her every year. She always writes, “I love you, hope you’re doing well. You’re in God’s hands.” She didn’t forget about me. She still had me in her heart. It reminds me of how she loves me. She moved to Omaha, Nebraska in 2006 but Arturo couldn’t find any work out there as a plumber, so they returned to L.A. We stayed in touch when she moved. It now feels good to have her in my life. I think teens should be aware of immigration and they should form their own opinions. Emilia’s story has given me a better sense of why people leave their countries and come to the United States. I’m glad Emilia has been able to have a better life here by having a home and raising a family and I think everyone should have the opportunity to do that. I believe that people who are in America illegally should be allowed to apply for citizenship. Just because they came here illegally should not be an excuse to kick them out. The world needs to understand their reasons for doing so, just like Emilia’s story. We need to give them a second chance, even if they arrived here illegally. Interesting perspective on illegal immigration that almost everyone in California has some experience with, but that is rarely expressed so clearly. Also –the links in the article work really well.